Furnishing new evidence of slower growth in health costs, a new survey by consulting firm Mercer said Wednesday that employers spent 4.1 percent more on health benefits this year than in 2011. It was the smallest increase in 15 years. 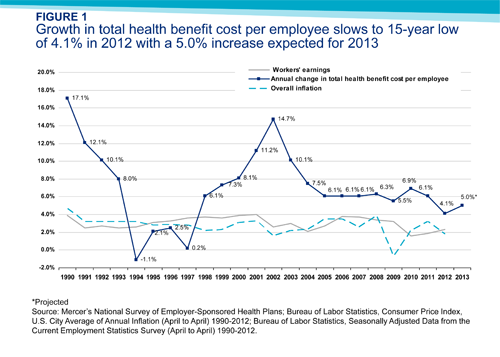 One reason, but probably not the only one: Employers shifted costs to workers through higher deductibles. Nearly 60 percent of very large employers (more than 20,000 workers) offer high-deductible, “consumer-directed” health plans, according to Mercer’s National Survey of Employer-Sponsored Health Plans. The portion of all employers offering consumer-directed plans rose from 17 percent last year to 22 percent in 2012, Mercer said. Deductibles of thousands of dollars for consumer plans decrease premium costs for employers and workers but raise out-of-pocket expenses. High-deductible coverage is supposed to prompt patients to seek less-expensive care, but critics say consumers don’t have the knowledge or tools to shop for surgery the way they buy cantaloupes and shampoo. A growing number of companies offer such plans as their only coverage. 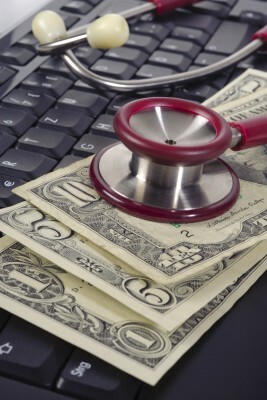 Total enrollment in consumer plans rose from 13 percent to 16 percent of covered employees. If the industry hasn’t already reached the tipping point for such coverage, “at this rate of growth it’s coming soon,” said Sharon Cunninghis, Mercer’s U.S. business leader for health and benefits. The survey was conducted from July into September and included government and private employers, of whom 2,809 supplied data. The portion of employers offering health plans rose for the first time in several years, Mercer said, perhaps because cost increases have moderated. Employer plan expenses averaged $10,558 per employee this year. The 4.1 percent increase for 2012 was substantially smaller than 2011?s rise of 6.1 percent and way down from the double-digit growth of the early 2000s. Economists continue to debate the reasons behind slower medical inflation, which has roughly coincided with poor economic performance beginning in 2008. One factor is that tight budgets and high unemployment have kept consumers from getting care they otherwise would seek, many believe. There has also been a proliferation of accountable care organizations and similar arrangements that reward caregivers for efficiency and quality. But high-deductible plans, which induce even people with insurance to think twice about seeing a doctor, are also seen as playing a role. In another Mercer finding, which could dismay supporters of the Affordable Care Act, the portion of small employers reporting they are “likely” or “very likely” to cancel health plans in the next five years rose from 19 percent to 22 percent. Of all employers, small companies are seen as most likely to terminate coverage and leave workers to find insurance on state health exchanges once they open in 2014. The slice of employers with more than 5,000 workers reporting they would probably shut down plans rose from 4 percent to 5 percent. Among all large employers (those with 500 or more workers), however, the portion likely to drop plans fell from 9 to 7 percent.